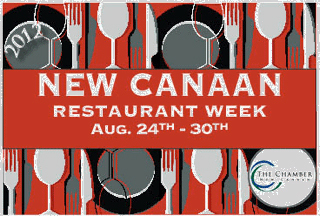 The New Canaan Chamber of Commerce set August 24 for its launch of the second annual New Canaan Restaurant Week (NCRW). From August 24 through August 30, participating restaurants will offer their diverse cuisines according to their own individual prix-fixe specials. Thirteen New Canaan restaurants will feature Restaurant Week prix fixe menus — providing diners a chance to sample their cuisines at attractive prices. Participating restaurants have a choice of two price points for their featured two-course luncheon menus and three-course dinner menus. Prix fixe will be: Lunch $10.12 or $15.12; and dinner $20.12 or $29.12. New Canaan stores will also enjoy the benefits of Restaurant Week. Playing off a theme of “Dine and Shop”, the New Canaan Chamber of Commerce is helping drive restaurant traffic into stores. There will be ‘surprise’ coupons randomly distributed at lunch for diners to enjoy discounts at participating merchants. Plus, printed materials distributed in the restaurants will encourage patrons to shop, after eating. The eventful week launches with the Taste of the Town Stroll on Thursday, August 23rd from 6pm to 9pm when restaurants and merchants throughout town will provide free hors d’oeuvres and drinks to the public. A fund-raiser for the New Canaan Food Pantry, the price of entry to the Taste of the Town Stroll is a non-perishable food donation at one of the drop-off sites on Elm Street, Main Street or Forest Street. Starting August 20th, Walter Stewart’s Market is supporting the cause by offering its customers the opportunity to buy two different donations packages in its store, which Walter Stewart’s will deliver directly to the Food Pantry. The evening culminates at 9pm in front of the Palace Theatre when dozens of prizes will be given away. The grand prize is customized spa party for six at New Canaan’s Aetheria Spa. Are you following us on Instagram yet? Click here to follow. Tag us in your food pics and use #CTRW!